Prick the skin of the duck breasts all over, then season with salt and pepper. Heat the duck fat in a heavy large skillet over medium heat. Sprinkle the caraway seeds over the bottom of the skillet. Place the duck breasts skin side down in the middle of the skillet. Arrange the apples in a single layer around the duck. Sprinkle the apples with the sugar. Cook the breasts without moving them until the skin is deep golden brown and crisp, 18–20 minutes. Use a fork to turn the apples as they cook so they brown on all sides. Turn the breasts over and cook for about 5 minutes. Transfer the duck breasts to a plate and let them rest for 5–10 minutes. While the duck breasts rest, continue to gently cook the apples until they are tender and golden brown all over. 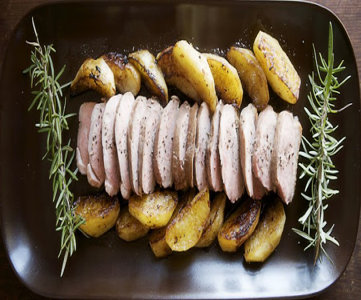 To serve, slice the duck breasts and arrange on a platter with the apples. Garnish with rosemary.